Did the apostle John really write the gospel of John? Q. I’m reading through your study guide to the gospel of John and getting a lot out of it, but I do have one question for you. Why do you consider the apostle John to be the author of this gospel? Isn’t it the consensus of New Testament scholars that it was instead the product of a later community that looked back to John as its founder and inspiration? I think it is quite possible that the writers of the gospel of John were disciples or followers who worked the apostle’s recollections and teachings into the form we find them today. But I would still say that the author of this work, in the sense of the person essentially responsible for its content, was indeed the apostle John. The scholarly debate about authorship is ongoing (some leading New Testament scholars continue to argue for John as the author in the most active sense), but I won’t review it here in this post. Good summaries of it can be found in most commentaries on the gospel of John, and I would recommend Brown’s particularly. Instead, let me discuss one feature of the gospel that I feel points strongly in the direction of John having been recognized from a very early date as essentially responsible for its content. The gospel appears to end with the assertion that “Jesus performed many other signs in the presence of his disciples, which are not recorded in this book. But these are written that you may believe that Jesus is the Messiah, the Son of God, and that by believing you may have life in his name.” This rounds out the main thematic development nicely. But then there is an epilogue, apparently added later, whose main purpose seems to be to correct the mistaken impression that Jesus had said the apostle John would not die before he returned. Reading between the lines a bit, we can recognize that when this epilogue was added, John had just died, and his death was undermining confidence in the gospel of John itself, on the part of those who believed he wouldn’t die. That’s why the disclaimer was needed. The fact that it was necessary to attach such an epilogue to the gospel, to preserve its credibility, strongly suggests that the gospel was largely completed before John died, and that it was considered within his lifetime to contain his teachings and recollections. Otherwise, his death would not have affected the reception of the written gospel so strongly. And it’s hard to imagine that anyone responsible in any sense for a work whose ethical teachings are so elevated would have allowed this belief in his authorship to persist if it had been inaccurate. In short, I feel that the epilogue that has been added to the gospel of John constitutes very early evidence, from just after the apostle’s own lifetime, that he was considered its “author” to such an extent that its credibility rested on his personal credibility. That is why I am very comfortable, despite the ongoing scholarly conversation, with the idea that the apostle John was the author of the gospel of John. But even so, the meaning and the message of this gospel can be appreciated without a commitment to any particular theory of authorship. 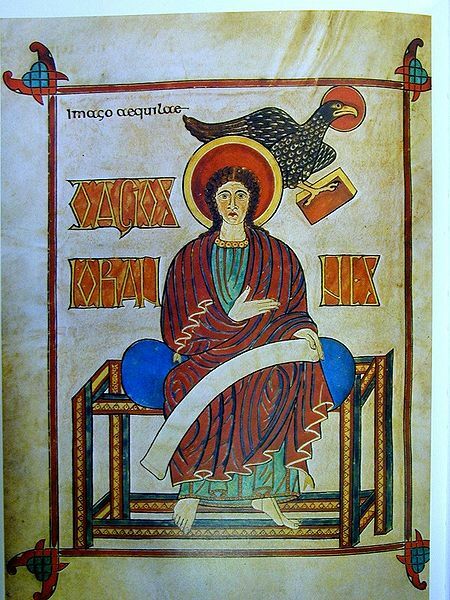 The image of John the Evangelist from the Lindisfarne Gospels. Thank you very much for this article, this has been a question at the back of my mind for some time and it’s great to hear your reasons for believing John to be the author. Perhaps you could address this as a whole new question but I was also wondering about the authorship of the book of Revelation. In your guide you state that it was unlikely to be the apostle John since in the Gospel of John and his letters he never refers to himself as John but goes by “the elder” or “the one whom Jesus loved”. Along with that textual evidence I was wondering what other evidence supports this view. Has the church traditionally seen the apostle John as the author or is that a more recent phenomenon? Thanks for your comment and question. Please see my reply here. Next Next post: Did the apostle John write the book of Revelation?